This recently completed splash pad was finished too late for warm weather this year, but community youngsters are ea gerly anticipating fun times here next spring and summer. 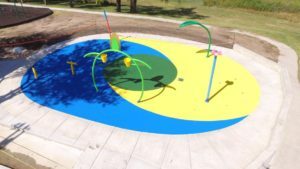 Those involved in the project said the workers who built the splash pad had good things to say about the community. Several commented on how unique it is for a town that size to be able to raise the funds for such a project. They also commented on the friendliness of the town. A grant from the Hansen Foundation helped make the project happen.